Hello! What's the one accessory that you can add to any outfit that will instantly make you look cooler? Hint: it's not a major statement necklace or perfect pair of earrings. It's a hip pair of sunglasses. Sunglasses have been cited by many major fashion bloggers and fashion insiders as their go-to for instantly looking cooler. And why? Well, studies have been done that have proven that sunglasses do make the wearer look better; it has to do with the balance and symmetry that is created by slipping on a pair of sunglasses. 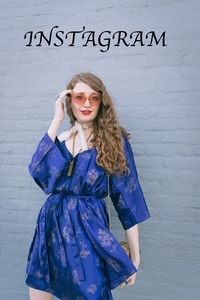 Throughout the past few years, I've collaborated with Giant Vintage Sunglasses and have tested out countless different pairs of their sunglasses. Heart-shaped sunglasses, butterfly sunglasses, classic sunglasses, major cat-eye sunglasses, etc. You name it, chances are that Giant Vintage has sent me a complimentary pair of that style to try out. Giant Vintage really does have an incredible selection of different styles. Looking for a rad new pair of cat-eye shades? What about a pair of bicycle sunglasses that can double as your look for Halloween? Well, Giant Vintage has them! I've loved every pair of shades that Giant Vintage has ever sent me. 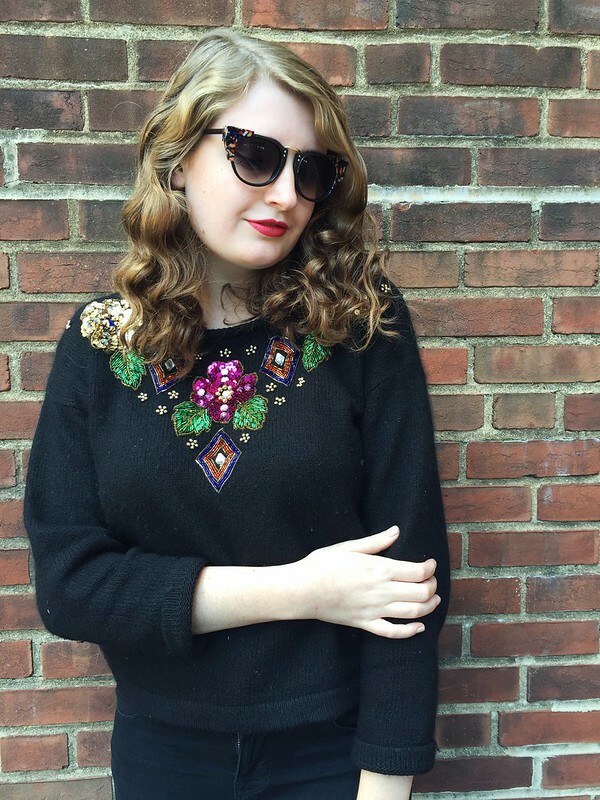 And almost every time I slip on a pair of my Giant Vintage sunnies, I receive compliments. Last weekend, I attended the Philadelphia Fashion Alliance launch and slipped on a pair and received so many compliments on my shades. I was even featured for my street style at the event HERE. Besides being really stylish, Giant Vintage sunglasses are also good quality. 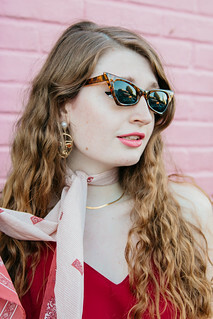 Even better yet, Giant Vintage stocks sunglasses that you'll actually be able to afford. The prices of the sunglasses range from about $12-$28. 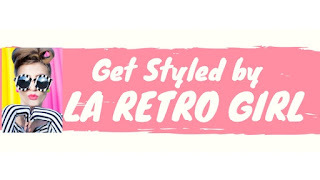 Additionally, use code LOLLY25 for a 25% discount. Throughout the past few years, I've learned which sunglasses look the best on my face: round sunglasses and cat-eye sunglasses. For this look, I pulled out my Giant Vintage "Ora" sunglasses. The cat-eye shape and playful detailing make this pair of sunglasses a new favorite. 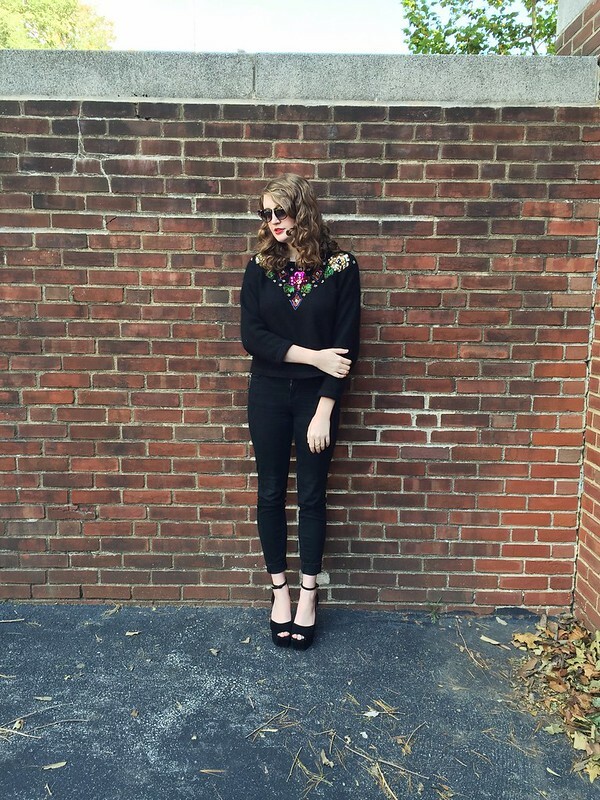 I styled it with a rad, embellished vintage sweater, black denim and black platform heels. Do you guys have a go-to pair of sunglasses?